The fast track court at Kangra today allowed the accused in the Aman Kachroo ragging death case to go to Shimla for appearing in the Himachal Pradesh High Court tomorrow. Taking a serious note of media reports on the issue of alarming situation of drug abuse and addiction among schoolchildren in Shimla, the state high court has issued notice to the state government. Second round of talks initiated by the Centre with partner states in the BBMB projects to settle Himachal’s claim on the direction of the Supreme Court concluded today with the one-on-one meeting between Union Power Secretary P Uma Shankar and Principal Secretary, power, Deepak Sanan, at Delhi today. Chief Minister PK Dhumal has urged the Centre to suitably modify the Forest Conservation Act to include eco-tourism as a forest activity in the larger interest of the state and preserving the forest wealth. Senior BJP leader from Uttar Pradesh and national vice-president of the party Kalraj Mishra will be the new in charge of the party affairs in Himachal in place of Satya Pal Jain. In yet another U-turn in the ongoing legal battle over the award of two mega power projects with aggregate capacity of 960 MW to the Brakel Corporation, the state government today reverted to its earlier stand and asserted that its decision not to cancel the projects was in the interest of the state. 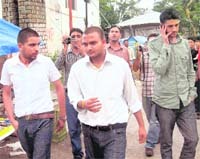 The District Congress Committee (DCC) elections have not only thrown up fights between two main rival camps, but has exposed rampant groupism among “upcoming contenders for the state leadership, including state president Kaul Singh Thakur, Leader of the Opposition Vidya Stokes, Rajya Sabha MP Viplove Thakur, Banikhet Congress leader Asha Kumari and GS Bali. The Commonwealth Games have come as a boon for flower growers of Solan district who are working hard to meet the increasing demand. The district, hitherto known for its off-season vegetables and mushrooms, is now making a mark by growing quality flowers, including carnation, gladiolus, sunflower, rose, narcissus etc. The Bhartiya Mazdoor Sangh (BMS), frontal organisation of the BJP, today targeted vociferous BJP Lok Sabha MP Rajan Sushant on its 56th foundation day at Rehan near here. Perturbed over indifferent attitude of the administration towards the demands of employees and problems being faced after installation of bio-metric machines, the Himachal Pradesh Secretariat Employees’ Association today met Chief Minister PK Dhumal. A speeding and loaded heavy vehicle, which was carrying fly ash to the ACC cement factory here at Barmana, hit three vehicles coming from the opposite direction on Wednesday night. It resulted in the death of one person and seriously injuring three others. The Ekal Nari Shakti Sangathan today urged the government to come out with a consolidated policy for giving financial, medical and other benefits to single women through various welfare schemes. The government has given nod for starting two new courses at Technical College, Sundernagar, from the current academic session. The police here has arrested a proclaimed offender, truck driver Gurmel Singh, of Bada Pind village, Ropar. He was evading court for the past 12 years after being arrested for rash and negligent driving, causing serious injuries to passengers. Earlier, the Kangra court, as a condition of bail, had restricted movement of all the four accused in the case from the jurisdiction of Kangra district. The four accused have been summoned by the high court that has taken suo motto cognisance of news reports regarding their release on bail and strong reaction from various quarters, including father of the deceased. Meanwhile, the appeal of state prosecutors against the bail granted to the accused came up for hearing today. The defence in the case sought time to reply to appeal application. The Judge then fixed the next date for hearing in the case on August 2. However, fate of bail to the accused students of Tanda Medical College now lies before the High Court that has taken suo motto cognisance of the case. While issuing notices, a Division Bench comprising Chief Justice Kurian Joseph and Justice Rajiv Sharma directed the Secretary (Home), the DGP, the Deputy Commissioner and SP, Shimla, to file their reply within two weeks. and around the city where the school students and youth could be easily seen smoking, chewing gutka, drinking liquor, consuming opium and other drugs. It is further alleged in the report that some areas of had become a safe haven for drug peddlers. It is also alleged that there has been regular intimation to the police about this but there is no action in the field either to check drug peddlers or to take action against those consuming drugs. While treating this report as a public interest litigation, the Bench listed this matter for further hearing on August 19. The meeting was a sequel to the joint meeting held in May last in which senior officers of all four partner states had participated. Himachal was the last state to be called for a “one-on-one” and similar exercise had already been carried out with Punjab, Haryana and Rajasthan. The states had stuck to their known stand during the joint meeting and the one-on-one was convened to ascertain and record their views. During the meeting, the state reiterated that it was entitled to 7.19 per cent share in the BBMB projects under the Punjab State Reorganisation Act against which it was being given only an ad hoc share of 2.5 per cent at present. It also sought 12 per cent free power as royalty in these projects on the pattern of the projects commissioned after September, 1990. The arrears on account of these two claims came to over Rs 2,200 crore in 1996 when the state filed a petition in the apex court. It urged the Centre to play the role of a mediator and ensure that justice was done to the state by giving it due share to which it was legally entitled. The apex court had given three months’ time to the Centre for the purpose. Punjab and Haryana, the states which would be affected the most if the issue is decided in favour of Himachal, maintained that the matter had attained finality and there was no need for reopening the settled issues. In fact, they maintained that even the 15 MW ad hoc share in the 990 MW Dehar Project was wrongly given to the state. In a letter to Union Minister for Environment and Forests Jairam Ramesh, he has sought his help in the matter so that the state could promote eco-tourism activities for which there was a huge potential. He said eco-tourism was being promoted universally and it would be the key to sustainable forest management in days to come as it preserved forests and also delivered economic benefits to villagers. He said eco-tourism promoted conservation of forests and international focus had been to create awareness about nature, underline the importance of wildlife and bio-diversity, generate direct and indirect employment for local communities and thereby reduce their dependence on forests. The exploitative dependence of local communities on forests was being increasingly restricted by law and it had to be replaced by a more sustainable, non-exploitative economic partnership with the cooperation of stakeholders. Dhumal said Himachal was probably the first state in the country to come out with a comprehensive eco-tourism policy-2001, which was further amended in the year 2005 to help promote public-private partnership in the sector, addressed all conservation issues and put in place adequate safeguards to ensure that negative impact of tourism was not replicated in the forest areas. The state had been moving ahead in promoting eco-tourism in forest areas with encouraging response from stakeholders, private sector, paying eco-tourist and local communities. Since 67 per cent of the state’s geographical area had been classified as forest, the future of tourism rested on eco-tourism, he added. Jain, who is also the president of the National Legal Cell of the BJP, had been looking after the party affairs in Himachal for the past two terms. Being from Chandigarh, he is a familiar face in Himachal as he is also the legal counsel in several cases in the High Court. Senior BJP leader and Rajya Sabha MP Shanta Kumar has been made the in charge of party affairs in Karnataka while former minister JP Nadda has been entrusted the responsibility of party affairs in Chattisgarh. While Shanta is the national BJP vice-president, Nadda is a general secretary in the party chief Nitin Gadkari team. In an affidavit filed yesterday in the Supreme Court where cancellation of allotment of the twin Jhangi-Thopan and Thopan-Powari projects was challenged by the Brakel Corporation, it has defended its earlier decision and refuted all charges of unfairness, arbitrariness and illegality against the state. All the decisions had been taken by the council of ministers after due deliberation and after considering the report of the committee of secretaries (CoS) headed by the Chief Secretary and advice tendered by the Law Department. The government had, initially, decided not to cancel the allotment on the basis of the report of the high-powered CoS. However, it subsequently took a decision to cancel the projects after the high court quashed the allotment on the petition filed by Reliance Infrastructure Limited (RIL) which had also participated in the bids for the two projects. It further stated that even the CoS, after consulting the relevant record, had not come across any incriminating documents which might prima facie indicate the commission of any criminal act by the Brakel Corporation. There were no allegations of malafide in the petition. The CoS had termed the process adopted by the previous government for the evaluation of bids as vitiated on the ground that it consciously overlooked the fact that the lead member of the consortium had made no definite commitment regarding equity participation. However, Brakel Corporation could not now be blamed at this belated stage for it as the government was legally considered to be a perpetual entity and that issues involved in cancellation of allotment of projects already made might not stand the test of legal scrutiny. Regarding allegations raised by the RIL, it stated that the state had been prompt to issue two show-cause notices to the petitioner which were dropped only after it was satisfied about the credentials and bonafides of Brakel Corporation. Regarding funds received by it from the Adani Group, it stated that borrowing of money by an allottee was not prohibited under the bid document and the hydropower policy. The anti-Virbahdra Singh camp has been spreading harangues over setback to the “Raja group” in the DCC polls for which the results were declared on July 20. Congress’ history in Himachal shows that Virbhadra faced his party opponents since 1989 onwards. Virbhadra was five-time chief minister. However, most of his tenures were replete with incidents of facing opponents such as Vidya Stokes, Viplove Thakur, Sat Mahajan and now Kaul Singh Thakur. Virbhadra, meanwhile, also acted as the “godfather” and appointed his “stooges” as presidents, including KD Sultanpuri. The importance of party leadership and power gained ground in the Congress when Sonia Gandhi became the president and Rahul Gandhi general secretary. If one goes by the DCC elections in Solan, Shimla, Mandi, Kangra and Hamirpur, the new generation of ambitious leaders such as Kaul Singh, Asha Kumari, Bali and Harsh Mahajan are clearing stage for themselves rather than scouting for “youngmen of integrity and character” that Rahul Gandhi has been talking about. On the other hand, the Congress has been spreading wrong message among over state’s 60 per cent of youth by keeping the issue of state youth president Manmohan Katoch pending just because “he is not liked by one individual leader”, resented party workers. Thanks to rampant groupism among new contenders, most of the new faces are “rootless” leaders who cannot win even ward election leave alone gearing mass support for the party. An annual business of nearly Rs 85 crore was generated through floriculture alone which had found liberal support from several government-aided schemes which enabled purchase of equipment. Various parts of the district, including Chail, Mahog, Kandaghat, Danghil, Basal, Nalagarh, Kunihaar and Dharmapur, were emerging as key areas where commercial cultivation of flowers was being undertaken. Farmers were buoyed by ready markets available in Delhi with the Commonwealth Games on the anvil. Verma went on to export seeds from Holland and finally adopted floriculture as a serious avocation. Mahog village presented marketing difficulties initially but these handicaps were overcome later as Verma worked enthusiastically to enhance his productivity year after year. Now, he manages to send eight to 10 boxes of various flowers to Delhi where the demands is immense in lieu of the October Commonwealth Games. He has set up poly houses in his farm after availing subsidy under the state government scheme. With drip irrigation mode being adopted, he has managed to enhance both yield and quality. The state government provides a liberal support of setting up poly houses at the rate of Rs 125 per sq m ordinarily and Rs 325 per sq m for technical types. As a special incentive to help farmers set up poly houses for floriculture, an assistance of Rs 13,500 was being provided for at least 2.5 bighas of land. Firing a salvo on the BJP MP, Kangra district president of the BMS Madan Rana, who presided over the celebration without naming Sushant, alleged that one leader was indulging in splitting the BMS unsuccessfully. Claiming that the BMS was too strong to split, he asserted that the leaders who had confrontation with workers’ organisations, had experienced political fallout in the past. Going one step ahead, he appealed to the BJP high command to take strict action against this leader and show him door otherwise the BMS would launch a morcha against him in New Delhi. Addressing members of various workers unions having affiliation with the BMS, Rana claimed that the BMS was the only organisation which had protected interests of the workers but also fought against injustice. President of the association Manmohan Jassal said the Chief Minister had assured that the government would look into the demands of the employees sympathetically. “We brought to the notice of the Chief Minister that the administration had been totally indifferent towards demands of the employees despite an agreement on several issues during the meeting on April, 28,” he said. Jassal said the issue of problems being faced in the software of bio-metric machines too had been brought to the notice of the Chief Minister. “We are keen that there is complete discipline and work efficiency as far as the Secretariat employees are concerned,” he said. He said the Chief Minister had directed the administration to hold a meeting on July 27-28 to resolve the pending issues amicably to the satisfaction of the employees. Driver Mohan Lal (45) of Billewal village in Hoshiarpur district in Punjab was killed on the spot when his jeep was hit by it near Gambhrola bridge on the National Highway-21. According to reports, the jeep was virtually thrown into 150-ft-gorge, killing Mohan Lal instantly and injuring two other occupants. The vehicle driver got confused and then hit another Swaraj Mazda loaded with vegetables and further hit another truck which turned turtle and blocked the national highway. Villagers rushed the injured to the regional hospital here while the body of the jeep driver was also taken to the hospital for a post-mortem examination. The national highway remained blocked for about seven hours during the night, causingtraffic jam. Haripal Singh of Deoli village in Nalagarh has been arrested. Addressing a press conference here today, Nirmal Chandel, state convener of the Sangathan, said despite several schemes aimed at giving benefit to single women, they were not reaching them. 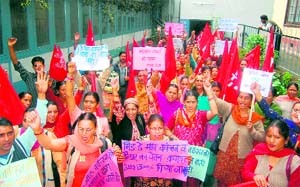 “In case a single woman is working as an anganwadi worker or a helper, she is denied all other benefits even though it is impossible for her to manage within the meagre salary,” she said citing an example. Chandel said the sangathan had presented a memorandum to Chief Secretary Asha Swaroop in this regard. “The procedural wrangles prove to be a major bottleneck in single women getting benefit of the nine welfare schemes under which they can derive benefit,” she said. “Women who are working and has an income less than Rs 18,000 per annum are entitled to benefits under the Mother Teresa scheme,” she added. She said when the government had fixed income criteria of Rs 18,000 then why were single women being denied benefits under various schemes. “Despite being the most vulnerable group, we are not getting free medicines nor treatment under the national health insurance scheme,” she lamented. She said even after working under MNREA, single women were not getting free treatment facility as they were given employment for only 14 days and then given a break. Meanwhile, sangathan members said thought the government had accepted many of their demands, single women, including widows, divorcees and unmarried women, continued to face a lot of problems. They said the plight of many single women was deplorable as she was denied property rights after the death of her husband. Women representatives from eights districts had assembled here to work out the plan for an action for pursue their demands with the government. Stating this while presiding over the review meeting of the technical education department here today, Minister for Technical Education Narender Bragta said the new courses would be introduced in civil engineering and electronics, with 60 seats each, and counselling for admission would be held in August, he added. He said efforts were afoot to start classes in four newly opened Industrial Training Institutes at Ghumarwin, Sandhol, Bhadrota and Tikkar from this academic session. Bragta said a sum of Rs 15 crore had been sanctioned for the 'State Institute of Engineering and Technology' at Pragtinagar, Kotkhai, for which detailed project report was being prepared. Steps were being taken to start classes at the proposed institute from next academic session. A building had already been selected for Technical College, Hamirpur, and the classes would begin soon. Superintendent of Police Kapil Sharma said here today that a special police party was deputed for the purpose which arrested the accused at Ropar as he was wanted for hitting his truck against an HRTC bus near Hotel Sagar View on the National Highway No. 21 near here in 1998. He was arrested after the accident, but later he jumped his bail and was declared a proclaimed offender and was since evading arrest.